A lot of freelancers get to the interview stage but fail to secure a contract because they do rookie mistakes. Most often, they don’t know better yet due to lack of experience. They may not even realize when their behavior is unprofessional or unethical. To help you be a better freelancer and land more projects, I’ll share the top three things I continuously see freelancers do during negotiations with freelance clients, which in most cases cost them the project. This happened to me very recently. When I was looking for a designer for the cover of my upcoming book, I wanted to have three different covers to choose from. I ended up with two, because one of the freelancers whom I liked changed the terms we agreed on right at the last moment. I preferred to let him go and proceed with two covers rather than have my arm twisted. Here’s a screenshot of the message on oDesk where I clearly stated the contract terms and asked the freelancer if he is willing to work on the contract. Sure will do this. Please send me the title, subtitle and other details of the cover. also please give me the links for the covers that you like most for the inspirations here..
Six days later, as promised, I got back to him explaining that one of the designers didn’t come through and I would need his services after all. I provided him with all the details he asked for – book title and subtitle, links to his covers that I liked, and some more info about the book cover and what message I wanted it to convey. Then I restated the contract details almost word for word as we have agreed on them six days earlier. I was ready to award the project to him and fund the first milestone right away. 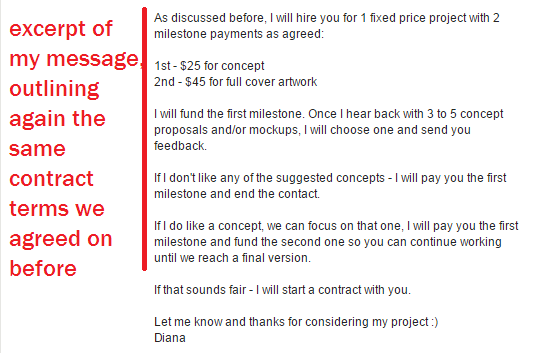 To my surprise, he replied the next day saying that he will send me only 2 concepts and that he wants me to fund one milestone for the full price because there’s no way for me not to like his work. This was highly unprofessional behavior. No matter how much I liked his designs, I instantly made a decision to not work with this freelancer because he is unreliable and quite possibly lacks work ethics and principles. His word didn’t carry much weight for me any more so should I start a contract with him, I believed I was more likely to get mediocre work or no work at all. Of course, there is the possibility that he lacks experience as a freelancer and he wasn’t even aware this is a somewhat unprofessional behavior. I checked his profile on oDesk once more – he had completed over 300 jobs. So he did have experience. Nevertheless, just in case, I replied to him. I shared my disappointment that he wasted my time. I explained that trying to change the contract terms in the last minute is highly unprofessional and that I would not be proceeding with him. If he were being unprofessional because he didn’t know better, I expected him to get back to me, at least to apologize, and maybe to try to change my mind. He never replied. So as far as I am concerned, this was an unprofessional freelancer who tried to take advantage of me. Looking at his work history on oDesk, he has good feedback, good reviews, repeat clients and he continues to get work. Based on his clients’ reviews, I am inclined to believe he is a good designer and a good freelancer to work with. However, I will probably not award a project to him, ever, because of the scenario I described above. 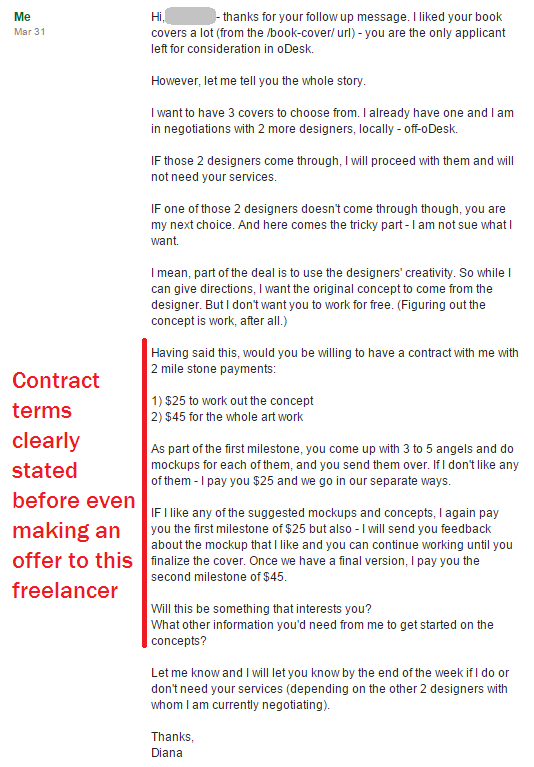 So this example comes to show how poor communication during negotiations with freelance clients can cause you to not only lose a prospective client but question your reputation as a professional freelancer. This is when you bait the client with a low rate and then, for example, double your rate in the middle of the project and hold the client hostage – either pay and get the project completed, or don’t increase the rate and be stuck with half-done project. This behavior is both unethical and unprofessional. The client may decide to increase your rate so that they get their project complete, or they may cut their losses and let you go mid-project without increasing your rates. Whichever route they choose, one thing is for sure – they will never contact you again. They most probably will tell their friends and colleagues how unprofessional you were. And if you got in touch with them through one of the popular freelance job boards like oDesk or Elance, they may even report you to the website for your behavior. In any case your reputation will be ruined. Think carefully if the few extra bucks are worth the risk and how such behavior fits your freelance business model. Note that this scenario is not about misplaced loyalty where you have worked for years with the same client and it’s time for you to negotiate market rates adjustment. And finally, don’t lie about your qualifications. It is a big mistake not to be honest about your skills and knowledge in your profile objective, in your cover letter, during your interview, or in any other case. Cheating on skill tests is one thing I see many starting freelancers on oDesk and Elance do. There are plenty of websites online, offering oDesk and Elance test answers for free. Don’t use them. Take your skill tests honestly. Sure, you can easily find the correct answers online and take the test to score the highest results possible. But if you cheated on the test, what good is that for you? Passed skill tests are of no use to you if you don’t actually possess the skills. Saying YES to everything the client asks is another thing I see many starting freelancers do. If you are not sure what the client wants, ask. If you are not sure how to do a task which the client will require completed as part of their project – research and find the answer before you say yes to the project. Don’t simply say yes to everything. Saying yes might secure you the contract but if you fail to complete it on time, with the agreed quality and within budget, what good that contract is to you? If you land a job because of a lie about skills and expertise, the client will know you lied soon enough simply because you won’t be able to do your job properly. This will lead to wasting both your client’s time and yours, his money, and eventually to ruining your reputation. 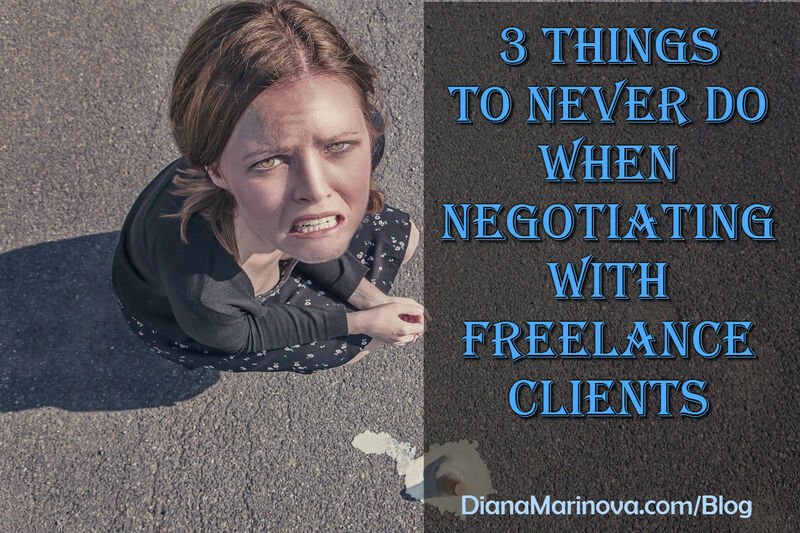 I hope you will never do these three things when negotiating with freelance clients. And if you use oDesk or Elance, be on the look for my upcoming book. It will go live on Amazon this Wednesday. (Join my email list to get notified!) It covers these and more tips about building your freelance practice the right way. Great post. Indeed this can be often seen in oDesk. Especially the ‘always saying yes’ part. I had similar experience few times. Fresh thing in my mind is from few weeks ago. My friend, developer, was looking for somebody to do Quality Assurance for his windows phone app. He posted the job with clear instructions and the main requirement was to have a windows phone of course, as well as quality assurance experience. One of the freelancers agree on the work, he said ‘yes’ to everything. It was little suspicious and he was looking to good to be true, but friend hired him. At the end it was like in your post. After hiring and when the money were deposited, the guy said: “I don’t have windows phone, can I do that for android?” My friend never mention android in the job. There is not even android version of the app :). But the freelancer probably only wanted to get the contract, and maybe he didn’t even read the job description.. I have a impression that this is happening in some particular regions or countries (will not list them because there are honest exceptions of course). It is as if the work ethics and the professionalism is in low level in those countries or something. Little away from the subject, but next time you need designer, please contact me. I have great designer in my team. Same for development related jobs. You are absolutely right, Aleksandaril – thanks for adding your story through a comment. It happens way too often that we all would like. I hope with the launch of Upwork and re-branding efforts of the platform, we will start seeing more quality clients and more quality freelancers. Then the people from your story will have no other choice but to adjust if they want to stay in the game. Between all great clients I had and still work for, there are some people scamming all over the place. Same thing happened to me even though I am experienced and working for more than 4 years over the internet. Maybe you can write about this kind of things so people are prepared. It is definitely part of freelancing life and we have to learn how to avoid these kind of things. If you will I will share my story in details. Basically the person hired me, and instead of paying me for the work, he took my money and run away :). I think section like this could be great addition to your book about freelancing. Hi, Alexandril. I have written on the topic of red flags for bad clients – here’s a post you can check out for starters. Also, I give away to my email list an ideal prospective client checklist – sign-up here and you’ll get it after verifying your email address. And finally, I do talk in my book about picking the right projects and clients – including red flags for bad clients, tips on how to get to know your prospective client before you even enter a contract with them, etc. One can tell a lot about a potential client from the way they construct their job post, address (or ignore) questions, the type of info they give or withhold, etc. Check out the book on Amazon – there’s a table of contents and a sample, too. The section about choosing your clients is Step 5. The three ‘No, no’s’ you have listed are an absolute must to maintain your credibility as ethical and dependable freelancer. Whoever the designer was who reneged on the terms of your contract, he probably thinks that he is the bee’s knee’s. Indispensible. Rot. When he sees the design you have selected for the cover of your book, if he does, he will realise that it was not you but he who got stung. Integrity in your financial commitments and honesty in stating your credentials, as you rightly write (unavoidable pseudo alliteration) are invaluable in establishing your credibility. Which is what gets you more work. Don’t cheat. Don’t prevaricate. Don’t lie. The three commandments of a successful freelancer.May I add a fourth? Don’t covet thy neighbour’s client. I know he’s an artist and not a writer, but his sloppy use of language and poor punctuation in the very first email would have been a red flag for me. Hi, Leanlulu – you are right, it was a red flag, but not enough of a reason for me to drop him as an applicant. A lot of good freelancers out there think abbreviating or skipping the subject in sentences is OK. They don’t know it’s kinda unacceptable when they write their cover letters. Unless it is absolutely broken and hard to understand English (which it wasn’t in this case), I always give them the benefit of the doubt. The designer was unprofessional. A deal is a deal. But it works both ways. Often a freelancer will agree to a lower price on a first project because the client promises her the next project will be at the freelancer’s normal rate. Then the client doesn’t want to pay more than he paid for the original project. This happens a lot. So a word to the wise: don’t offer a bargain price in the hopes you’ll get paid more on your next assignment. You are absolutely right, Jeannette – unfortunately, it does happen so that clients don’t always keep their end of the bargain. And I hope you don’t mind, I’d like to add a link as a result of your comment – I have written a post on the topic of lowering your rates for clients who promise future work – hope it helps someone who’s reading your great comment and tip! Yeah I agree with you regarding maintaining the terms while have deals with clients. Well I’m also a freelancer and these tips are very helpful. Loved this, well I guess I’ve also faced similar issue with a freelancer at elance. At first he seems to be very professional and later started showing his response and I doubt about his skills as per the conversations he seems to be a newbie. Anyway thanks for sharing your experience. Hope you don’t encounter such freelancers (or clients) in the future. Are the tests even necessary? I see many of the top freelancers without them. I’ve purchased your book but haven’t read it yet so curious to see your recommendations inside.